Featuring 2 upstairs King Bedrooms, 1 has a jaccuzzi bath tub and balcony with a breathtaking waterview - the 2nd bedroom also has a King Bed and spacious layout. Living room area is a large living area open into the kitchen and dining area. 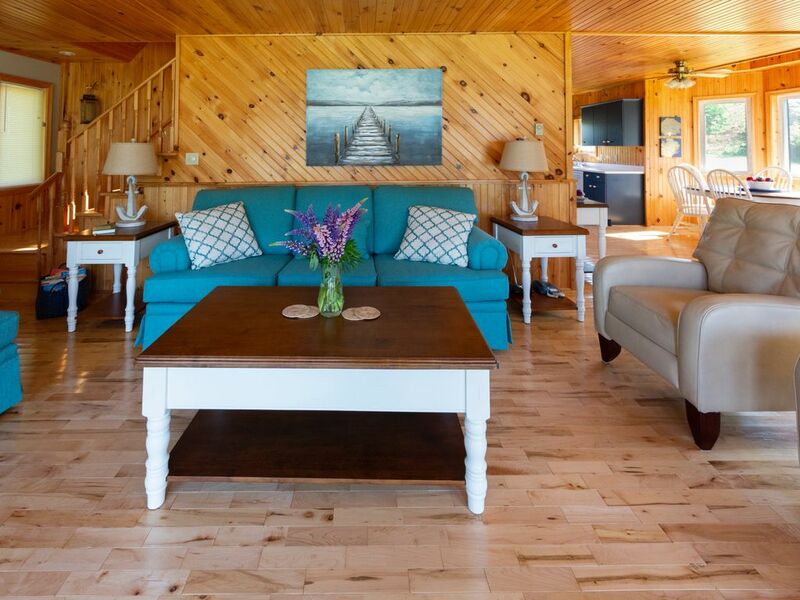 This cozy and quiet property is perfect for a family retreat. See the sights and experience the island during the day and enjoy time by the fire, stargazing in the evening surrounded by PEI's natural beauty. A true "home away from home"
Electric Wall Heaters in each room. 3 Single kayaks, 1 double seat kayak available upon request. This was our first time staying at the Sandy Days Beach House..... and what a lovely surprise! The owners were wonderful, checking in with us throughout the week to see if there was anything we needed. As for the property, it is super private, the yard is large, mowed and clean....with very minimal mosquitos, a wonderful private beach, and large fire pit with all the wood, kindling and paper provided! The inside of the cottage was very clean and beautiful, with added luxury items we were not expecting.... the beds are decked out with top quality mattress and bedding, so comfortable I wanted to stay in bed all day! It truly gave us all the rest and relaxation that we needed and made our stay even more special than we imagined. I will definitely recommend this paradise to all my family and friends! Lovely visit! Jeff was very accommodating. He even made sure that he had a crib for my 19 month old daughter and a baby gate to prevent her from climbing the stairs. Beautiful property and so nice and quiet. Would definitely recommend!! What a great place!! The house & amenities were as advertised. The location was perfect... quiet & private with beautiful views of the water. Our favorite spot was the deck in the morning relaxing with our coffee/tea & listening to all the different birds! The house is meticulously decorated with very comfortable furniture & high-end bedding. The owners were conscientious, friendly & easy to work with. We would definitely book again if we're ever make it back to PEI. Thank you!! Our turn over day is Saturday, check in is at 3 pm on the saturday, checkout is at 10am the next saturday.